Cabin house plans are small in nature and are often used as vacation homes or secondary residences, perfect for weekend getaways. They are generally known for their rustic appearance and ability to blend with their natural surroundings. Many times, cabin home plans are built as a hunting or fishing retreat and work well in the mountains, beside lakes and in wooded areas. The exterior finish and trim often consists of natural materials such wooden siding or shingles and stone. Outdoor living spaces such as covered or screened porches encourage the enjoyment of nature. Inside, cabin floor plans deliver the basic amenities. They usually provide one or two bedrooms (or maybe an upstairs sleeping loft), a full bath, an efficiency kitchen, and an open floor plan with the kitchen and eating space adjoining the living area. Sometimes, cabins even include a fireplace and a stacked/washer dryer unit. The interiors are usually finished with wood continuing the rustic feel inside the home. 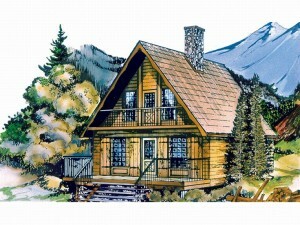 Log cabins are perhaps the most well known cabin home plans. The designs in The House Plan Shop’s cabin house plan collection are typically less than 1220 square feet and do not have a garage. Due to their small nature and ability to fit into the surroundings almost anywhere, cabin floor plans are closely related to cottage home plans and vacation house plans.